Since the moment my daughter escaped my womb I've had to hear about how much she looks EXACTLY like my husband, his sisters, his aunts, his grandmothers, his million-times removed fourth cousin, you name it. I always knew this was said with love but that never stopped it from stinging my ego a teeny tiny little bit. Okay. A LOT. After all, my husband didn't just carve our daughter from play-doh in his image. My DNA is mixed in and my side of the family wanted to wrap their tree roots around her as well. However, the older my daughter grew, the more unmistakable her lineage has become. It's as though Bruce's genetics and mine mud-wrestled until he was declared the victor and I was left sitting in a rubber tub scooping goo out of my eyes. Ken strongly resembles her father, she is a spitting image of one of his sisters, resembles the other sister, and heck she probably looks like both of his grandmothers, each of his cousins, and likely their family's favourite next-door neighbours all rolled into the shiny package I call my daughter. I am older and wiser now, and for the most part, more mature, so I no longer get my knickers in a twist when someone points out how much she looks like her father or one of his family members. There is enough of me in my daughter that I can proudly take ownership of her. She has my figure. My facial expressions. My quirks. She is my mini-me and for as often as she's told she looks like some member of her paternal family, I look at her and see flashes of me staring back. A few weeks ago I sat at the kitchen table, her grad proofs spread out before me, and emotion clawed at my heart. I recalled staring at her wee face as an infant and wondering just what she'd look like when she grew up while dreaming of the person she'd grow to become. All those years ago it was hard to imagine a time when I would be sitting at a kitchen table trying to choose which of her grad photos to buy. "Mom? Are you okay?" Ken asked as she looked up from across the kitchen table where she sat doing her homework. "I'm fine. Just trying to choose a photo from these proofs." "You look like you were about to cry." "I am. 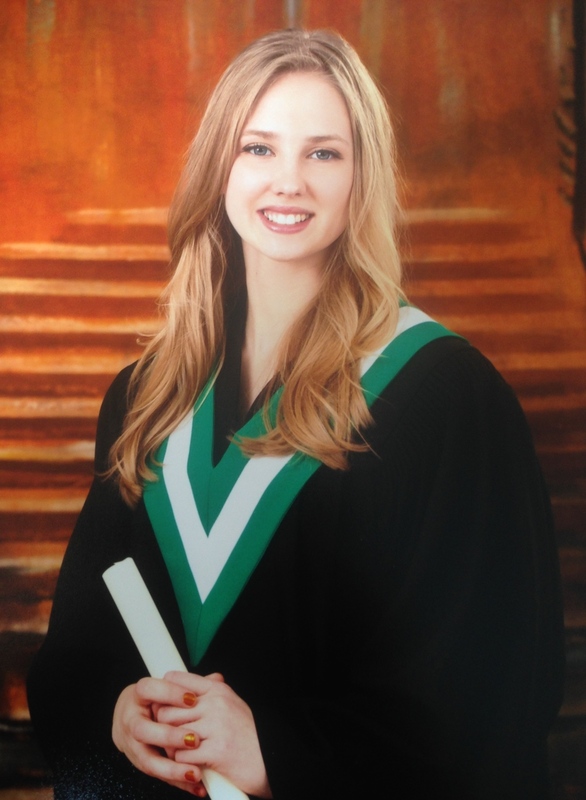 Have you seen the price of these grad photos? It's enough to bankrupt a family," I half joked, while wiping the corners of my eyes. "Oh, I thought maybe the pictures were making you cry." "No! You look beautiful in them!" She shook her head as she disagreed with me. "No I don't. I look like a stringy haired, goober. I hate them." She hates them. Of course she does. I looked back down at them, trying to see what she saw. Apparently I was blinded by maternal love. I wasn't seeing the monster she professed to look like. "You look lovely. What about this one?" I asked as I pointed to proof number 7. "That one? NO! I have a stupid look on my face." "It's a STUPID smile." Right. Of course it is. My bad. "What about number 19. That's your dad's favourite." She looked at 19 and shook her head emphatically. "No, my hair looks weird." "I looove number 13. You look stunning." She peered at the image I was pointing to and snorted, "You mean, I look STUNNED." Hard to please. Yep. She's totally her mother's child. "Okay," I sighed, "which photo do you like? We'll get that one. There are 22. One of them must be all right." Ken shook her head. "I can't choose. I hate them all. All of my friends look a million times better than I look." "Oh my vain princess. I'd have killed to have grad proofs like these. I can't choose a picture from your grad proofs because you look beautiful in every one. My mom couldn't choose a picture from my proofs because I looked ridiculous in every one." "I doubt that Mom. You are beautiful." "I've trained you to say that. Good job." Her indoctrination is almost complete. "But I've got proof. Hang on," I said over my shoulder as I walked to my bedroom. A few minutes later, I thumped a dusty photo album onto the kitchen table and started flipping pages. My past stared back at me from yellowing photo album pages that were stuck together. High school friends, crushes, birthdays, pets. Old memories that had been forgotten or fuzzed with time. And then, my grad proofs. "Here. Eat your words, child," I chortled as I slid the photo album over to her. And this wasn't even the WORST picture. She didn't stop laughing for the rest of the night. Staring at her grad photos next to mine, I've never been more grateful my kid looks just like her daddy. There is only so much room on the wall for grad photos like mine. Ken's official picture. My choice. Wisely, she never argued after seeing mine. Smart girl. Just like her momma.